Hydrangeas are relatively easy to grow with a variety of flower colors and sizes. The popularity of hydrangeas has grown tremendously during recent years. As a group, they can bloom from May through fall and have features that garner interest into early winter. Their name, hydrangea, comes from the Greek words “hydor” meaning water, referring to the plant’s preference for moisture, and “aggeion” meaning vessel, referring to the shape of the seed capsule (Oregon State University, 2015). Below are pictures of common hydrangeas grown in Ohio. This fact sheet will help Ohio gardeners select hydrangeas based on the ability to attract pollinators, plant maintenance needs, and site requirements. Gardeners will also be able to compare the different hydrangea species for maintenance, bloom size, timing of flowers, and other unique characteristics. There are six species of hydrangeas commonly grown in Ohio. In this fact sheet, bigleaf (Hydrangea macrophylla) and mountain (Hydrangea serrata) will be discussed together based on their similarities. The cultivars discussed in this fact sheet are based on observations through several growing seasons, as well as documentation in the literature. Other cultivars not listed or discussed will grow in Ohio, but there is simply not enough room or local research experience to list them properly. There are too many new hydrangeas on the market each year to list all possibilities for gardening success in Ohio. Gardeners must continue to observe new cultivars and perform basic research to make the best selection for their garden. A chart is included at the end of this fact sheet which summarizes the species discussed to further aid gardeners in selecting of plants for their gardens. Common hydrangeas grown in Ohio: Hydrangea macrophylla ‘Double DelightsTM Perfection' (top left), Hydrangea quercifolia ‘SnowflakeTM’ in early bloom, honey bee on Hydrangea paniculata ‘Great StarTM’ with elongated petals (bottom left), and Hydrangea arborescens ‘Invincibelle® Spirit’. There are many characteristics of hydrangeas to consider when choosing the right plant for the landscape. To get started, there are two main features of particular importance for hydrangeas: flower hardiness and the ability to attract pollinators. Some hydrangeas may not bloom each year in certain parts of Ohio because of cold weather or improper pruning habits. The challenge is based on whether the buds are formed on old or new wood. Old wood refers to the previous year’s growth. The buds for the current year’s flowers were formed the year before, usually in August. If these cultivars are pruned or cut down in the fall, there will be little to no bloom the next year. New wood refers to the current year’s growth. Cultivars that bloom on new wood set their buds during the year in which they bloom. These plants can be pruned in the fall or the very early spring. Bigleaf hydrangeas (H. macrophylla cultivars) bloom on old wood and will lose their flower buds when exposed to USDA hardiness zone 5 temperatures and lower. USDA has developed hardiness zones from northern to southern Ohio, based on a 30-year average of temperatures. Ohio’s USDA hardiness zones range from 5b, where low temperatures average from –15 to –10 degrees F, to 6b, where low temperatures average from –5 to 0 degrees F (USDA, 2012). This map is based on a 30-year average, so Ohio does receive temperatures colder than this on a regular basis. Some cultivars of bigleaf (H. macrophylla) and mountain (H. serrate) can bloom on old wood and new wood. Purchasing a plant that blooms on old and new wood provides gardeners with a higher chance of successful blooms each year. Providing winter protection will increase success even more. Details are reviewed within the discussion of each species in this fact sheet. Attracting pollinators and providing food sources for them is a growing trend. 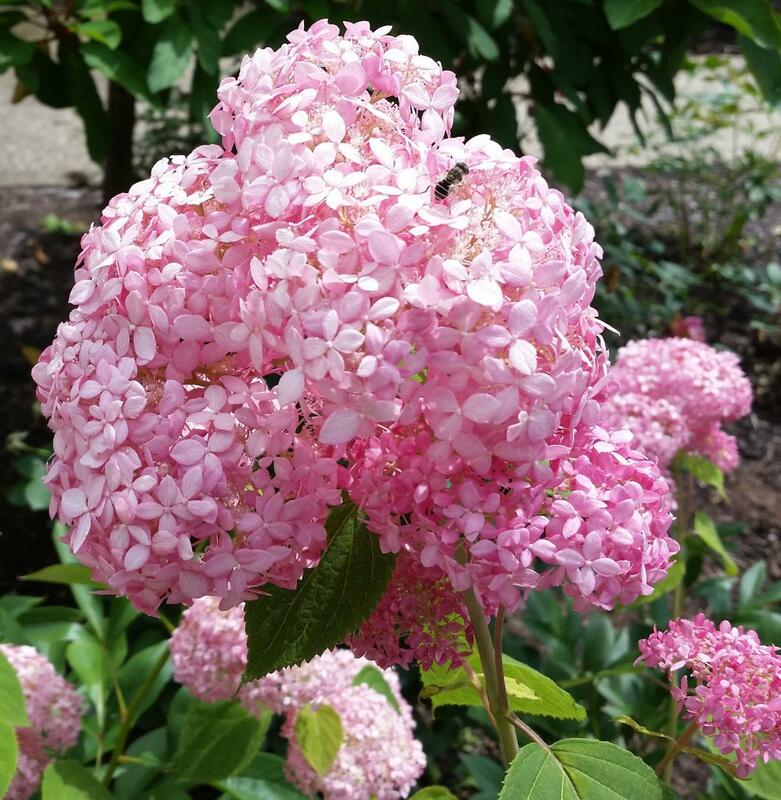 Most gardeners think of hydrangeas as large, mophead-type blooms (see below) with mostly infertile flowers that do not provide the pollen necessary to attract pollinators. But, there are other cultivars of hydrangea which have fertile flowers which provide pollen and attract pollinators. Lacecaps—combination of infertile and fertile flowers, usually with the infertile flowers around the outer edge of the flower head (Dirr, 2004). Thus, selecting hydrangeas with lacecap flower heads will be important in attracting pollinators to the garden. When researching and conducting observations of cultivars for the Ohio Phenology Project, Ohio Master Gardener Volunteers identified that certain cultivars of oakleaf, smooth, and panicle hydrangeas were attracting a high level of some pollinators, in spite of previous beliefs that these hydrangeas would not attract pollinators. 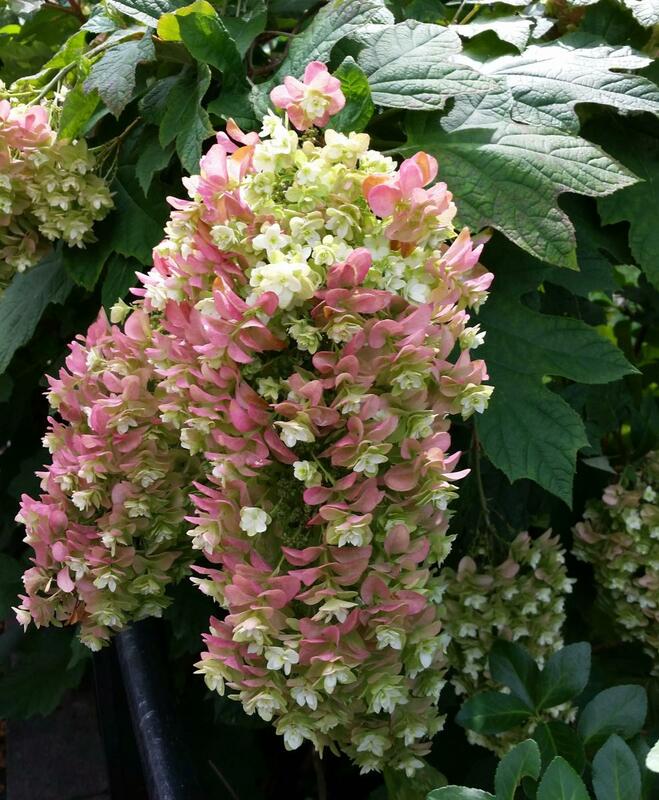 More research and observation is needed in this area to make a complete list of cultivars that are attractive to pollinators and so far the project suggests Oakleaf hydrangea flowers are frequently visited by pollinators. 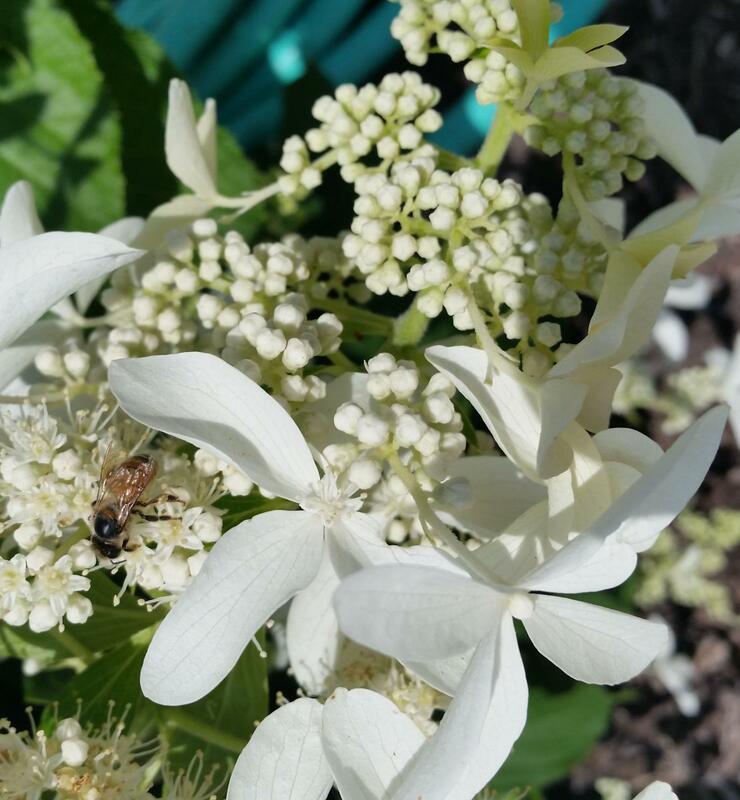 The fertile flowers of Hydrangea paniculata 'Great StarTM' are attractive to pollinators. Some species of Hydrangea arborescens such as 'Invincibelle® Spirit' have a few fertile flowers that are attractive to pollinators. Hydrangeas are woodland plants so most species need some shade even if labeled as full sun. The amount of shade required will vary depending on soil quality and water availability. Many cultivars are listed as full sun to partial shade, including oakleaf and panicle types. Bigleaf cultivars require moderate shade due to their high water requirements. Hydrangea paniculata ‘Vanilla StrawberryTM’ fades to dark pink and even purple when grown in partial shade, with less than four hours of sunlight per day. In the garden, most cultivars grown in full sun will have flowers that fade to brown more quickly with drooping leaves during the hottest part of the day. Increased watering can decrease these effects of full sun. On the other hand, dense shade will result in reduced foliage and smaller flowers on some cultivars. Morning sun with shade in the afternoon is ideal for smooth, oakleaf, climbing, and panicle types. These species tolerate sunnier areas if proper soil and moisture conditions are maintained. Bigleaf hydrangeas require more shade, especially in the heat of the day. The amount of sunlight received is a predictor of water use by certain hydrangeas (Fulcher, et al., 2017) and affects flower longevity on certain cultivars. For example, when researching Hydrangea paniculata ‘Vanilla Strawberry’ in two sites in Canfield, Ohio, interesting differences were noted. When planted in full sun, the blooms of this plant are vibrant for 3–4 weeks, then fade to brown. When planted in partial shade, these flowers are vibrant for six or more weeks, with blooms fading to dark pink, and even further with tinges of purple in late September and early October. Thus, the low exposure to sunlight in the shade impacts flower life and allows the unique attributes of the aged flowers to be expressed. Many other hydrangea cultivars in the research site had flowers that aged to a lime green color, but these turned brown in areas of full sun. If planting hydrangeas near evergreen species, be sure to plant away from the roots or drip line. Many evergreens have shallow root systems that compete with hydrangeas for water. Hydrangeas prefer a loam soil which has more sand and silt than clay. 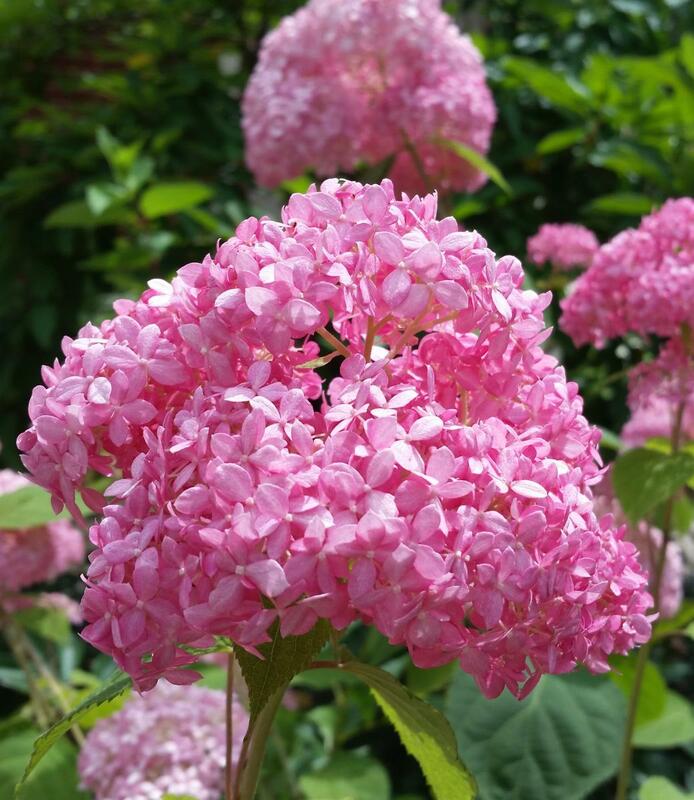 Hydrangeas need a well-drained soil that also has water-holding capacity. Thus, a loamy, well-drained soil is the perfect location for growing hydrangeas. Many areas of Ohio contain heavy clay soils. Because clay soils drain slowly and can hold moisture for periods of time, they provide poor conditions for hydrangeas. To improve soil conditions, gardeners should amend clay soils with organic matter before planting hydrangeas. If soil conditions are not improved, plant vigor will be reduced, plants become stressed and more susceptible to diseases as well as winter injury. While hydrangeas need water, they do not like wet roots and require adequate drainage. Hydrangeas should not be planted in an area where water is slow to drain after rainfall. In these areas, raised beds should be considered to improve the drainage of the planting area. Water needs of hydrangeas depend on the species, and even cultivars within a species may have different requirements. Bigleaf hydrangeas have the highest water needs and oakleaf have the lowest. All species should be watered thoroughly and and mulching hydrangeas will help hold moisture during dry spells. Bigleaf hydrangeas require special attention to watering, especially when exposed to hot sun for portions of the day. If leaves are drooping, gardeners should use drip irrigation or soaker hoses (Chappell et al. 2017). Contrary to popular belief, hydrangeas are susceptible to disease. While in the home garden there are few incidences of aggressive diseases but some injury may still occur. The most common diseases observed in hydrangeas are Cercospora leaf spot (Cercospora hydrangea) and powdery mildew. Cercospora leaf spot seems most common in newly purchased plants, which were grown in crowded spaces, and in oakleaf hydrangeas. Removing fallen leaves at the end of the season will reduce infection the following growing season for Cercospora leaf spot and most other common diseases. Powdery mildew symptoms look like baby powder sprinkled on the leaves of the plant. Thinning the plant when pruning and reducing some foliage to improve air circulation will help to reduce powdery mildew as well as other diseases. Rainy and wet seasons provide ideal conditions for diseases to flourish. 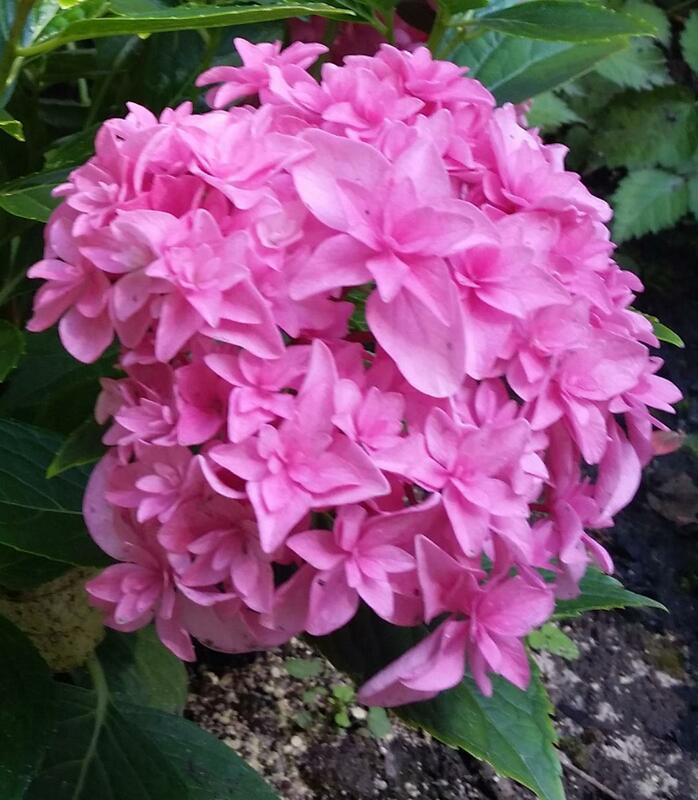 By planting hydrangeas in the proper location, with proper soil conditions and adequate space for the plants, most diseases can be minimized (Penn State University Extension, 2017). Aphids can build populations quickly on some flowers early in the season, especially on oakleaf hydrangeas. Aphids can be dislodged from the plant with a forced stream of water from a hose to provide effective control. Japanese beetles can be a concern on several species, so gardeners are encouraged to scout early for beetles. Effective control can be achieved if adults are picked off on a regular basis. An emerging concern is the hydrangea leaftier moth, which is showing up in landscapes in Ohio. Proper identification of insects or disease is important for effective control. Consult other fact sheets on ohioline.osu.edu or contact your OSU Extension office for information about identifying insects or diseases. 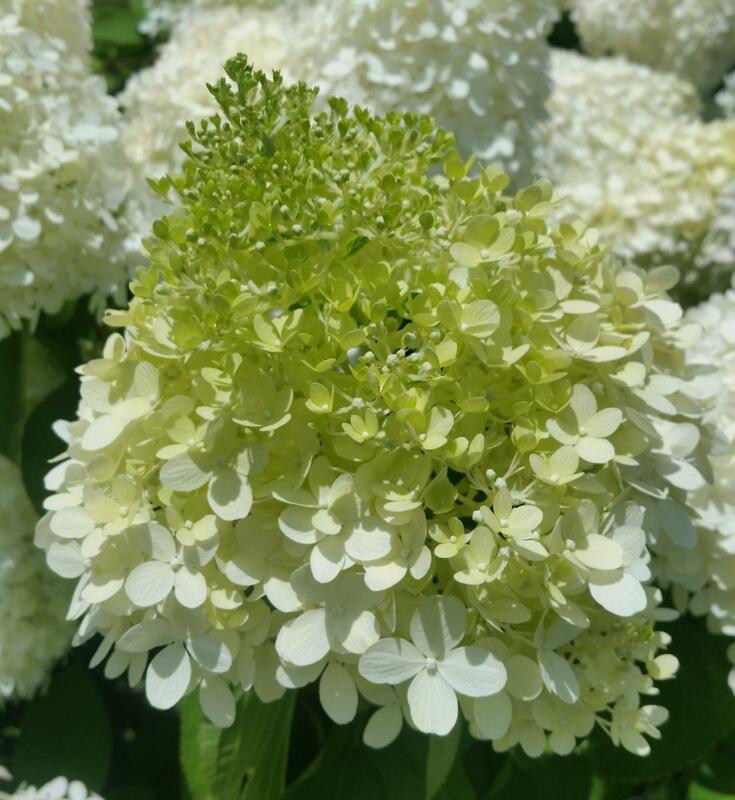 Hydrangea arborescens ‘Annabelle’ is a smooth hydrangea with a rounded flowerhead. Hydrangea arborescens is native to North America. The plant is considered somewhat short, growing to only 3 feet tall each season. Flower heads are mounded and size depends on the species and pruning. Most years, this species will bloom at the end of May in southern Ohio and early June in northern Ohio. Cultivars of this species have either white, cream, pink, or lime green flowers. Flowers will fade to lime green later in the summer if ample moisture is available to the plant. Faded flowers remain through the part of the winter, even with most stems breaking and flower heads falling to the ground. This plant is ideal for USDA hardiness zone 4 and blooms on new wood each year. Smooth hydrangea can easily be divided for propogation in the fall of the year. This plant can be cut down to less than 4 inches each year, either in late fall or very early spring before new growth begins to emerge. The cutting encourages more uniform flowers and a more formal look the next spring. Selective pruning of new growth in mid-spring to reduce the number of stems will produce larger blooms, with some flower heads measuring more than 12 inches across. If the stems from the previous year are not pruned, the plant will have more blooms, but the blooms will be somewhat smaller and uneven, creating more of a cottage-garden feel. Hydrangea quercifolia is native to North America. This species has a range of sizes, dependent on the cultivar. The plant can be short and rambling, or tall and stately. Shorter cultivars stay below 3 feet, but the branches tend to spread 2 to 4 feet in each direction in a rambling pattern. Taller cultivars get up to 8 feet tall. Flower heads are pyramidal, with single petal flowers staying mostly upright. The panicles can be 6 to 12 feet long and sometimes even longer. There are at least two cultivars that appear to have double blooms: ‘Snowflake’ and ‘Gatsby’s Star’. The weight of these blooms causes them to droop, making a unique feature in the landscape. Aging sepals will fade to pink and other shades of red as new sepals emerge above them. Full sun will fade the blooms to brown, so plants in dappled or spotty shade will have the longest flower life with the most interest. This species begins to bloom in mid-June throughout Ohio. are stunning drooping from the plant. The leaves of oakleaf hydrangeas are the most attractive attribute of this plant. As the common name implies, the leaves resemble an oak tree leaf. Some have rounded tips, while others have pointed tips. Leaves of this plant can be 12 inches long on some cultivars and the leaves have stunning red and purple fall colors. The fall color makes this a great replacement plant for the common burning bush, Euyonymus alatus. Oakleaf hydrangeas bloom on old wood, which means it blooms on previous year’s growth; the buds will survive low temperatures, even below zero. In the winters where temperatures go below –10 degrees F, buds may be damaged, resulting in partial bloom the next spring. At temperatures below –20 degrees F, all buds will be killed resulting in no flowers the following growing year. This species can be propagated by layering. To layer, bend a lower branch to the ground in spring, cover it with soil, then a brick to keep it in place. Leave 6 to 8 inches of the tip out of the soil. This new layer can be removed for transplanting in the late fall or the following spring. Hydrangea macrophylla (bigleaf) and Hydrangea serrata (mountain) are similar in appearance and have blue or pink flowers, depending on cultivar and soil conditions. Hydrangea serrata is somewhat hardier than Hydrangea macrophylla, but less robust (Dirr, 2004). These two species are desired by gardeners for the showstopping blue and pink colors. Most of these hydrangeas have mophead flowers. The cultivar ‘Nikko Blue’ is an industry standard and commonly sold in garden centers throughout Ohio for its size, number of flowers, and ability to be consistently blue in the right soil. 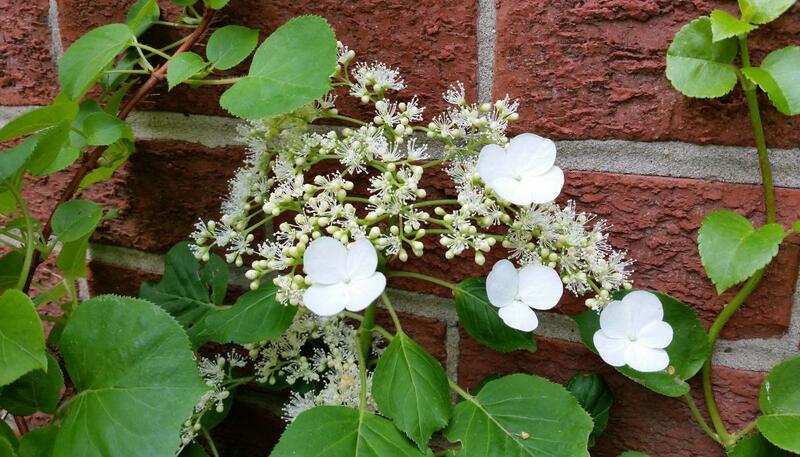 Gardeners need to be aware that this plant blooms on old wood and thrives most when grown in a protected area or microclimate similar to southern Ohio. In colder areas of Ohio, winter protection is required or the blooms will be non-existent or sporadic. Winter protection is explained below. In years with no blooms, this plant will grow larger than other macrophylla cultivars and have beautiful green foliage. Newer cultivars of bigleaf hydrangeas bloom on old and new wood, and for most gardeners, these are the best options for success. Gardeners need to protect these plants during April freezes or the stressed plant will delay or reduce blooming for the season. Winter protection is still recommended. Most gardeners may not be successful with these plants simply because the site conditions are too harsh and the soil conditions are improper. Remove the winter protection once new leaf buds begin to emerge in late March. Provide protection from hard frosts in April and early May. Winter protection may work well, but forgetting to protect from late spring frosts will make the effort futile. Troubleshooting When There Are No Blooms: If a gardener is experiencing no blooms on their plant, it could be a cultivar that only blooms on old wood and the blooms may be accidentally pruned off in the fall or spring of the year. If the cultivar is not known and there is not consistent blooming every year, then new growth should be observed for buds during the current growing season. If the plant only blooms on old wood, gardeners who can’t provide winter protection should choose a new cultivar that blooms on both old and new wood. Another reason for lack of blooms may be plant stress due to improper soil conditions, such as mostly clay soil with poor drainage. Soil conditions should be improved before planting this plant for optimal success. Gardeners should plan to water this plant during dry spells and whenever affected by exposure to hot sun. 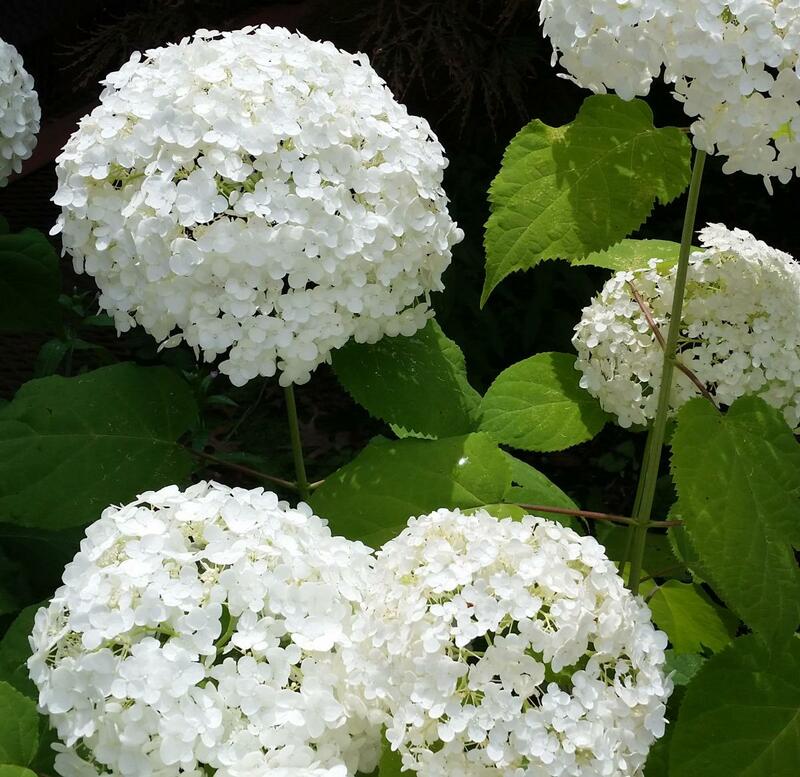 Bigleaf hydrangeas tend to have heavy nutrient needs, so a balanced fertilizer will ensure proper growth and flowering throughout the growing season. 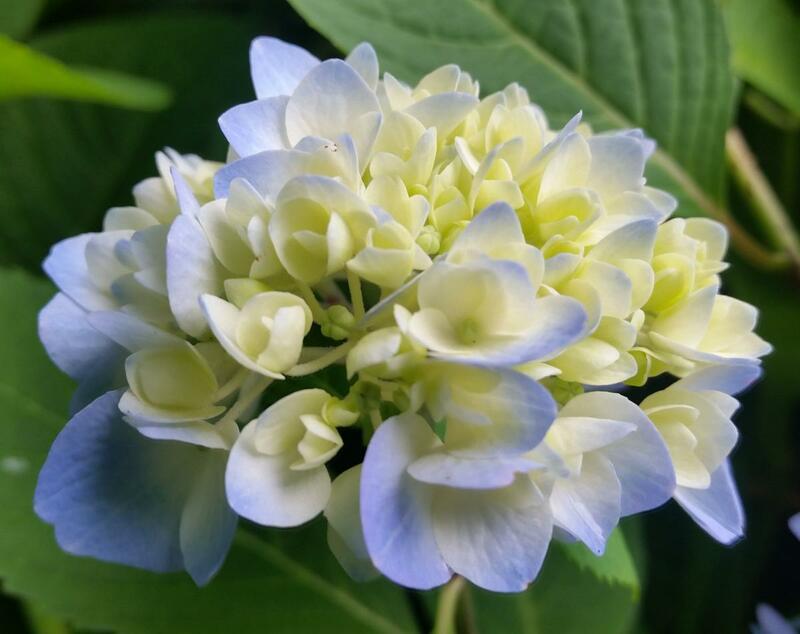 Blue or Pink Flowers: The soil pH and corresponding available aluminum in the soil makes the flowers of mountain and bigleaf hydrangeas appear blue or pink. At lower pH levels (acid soils), aluminum is more readily available to the plant and flowers become blue. At higher pH ranges (more alkaline soils), aluminum is less available and flowers are pink. The soil pH should be 5.5 or below to get consistent blue and 6.5 to 7.5 for consistent pink in mineral soils (Dirr, 2004). Gardeners should have the soil tested with a soil lab for an accurate pH measurement, along with the necessary information and recommendations to apply the correct amount of lime or sulfur for the desired flower color. Hydrangea macrophylla Double DelightsTM 'Perfection'. 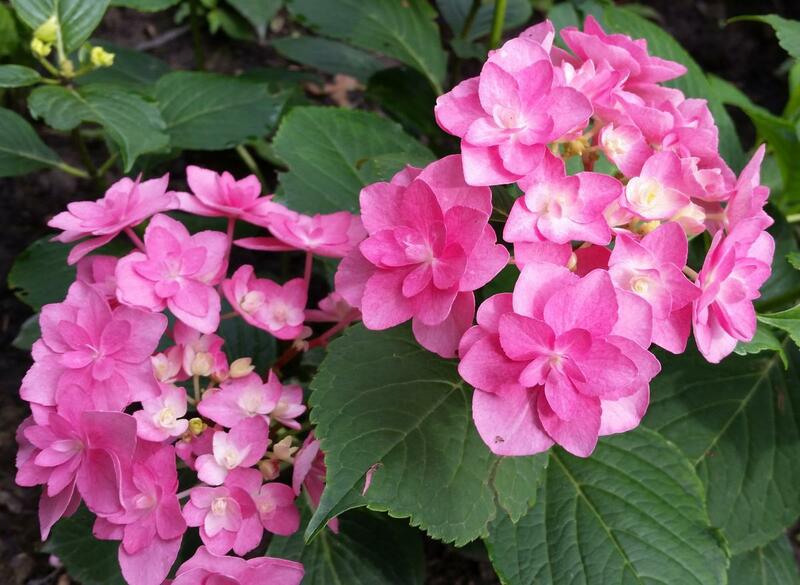 Hydrangea macrophylla 'All Summer Beauty' in early bloom. Raising pH in the soil takes longer than lowering; gardeners may need to wait a year before seeing a noticeable change from blue to pink flowers. Even when the pH is lowered, some flowers may not turn blue in a year as some soils may be high in phosphorus and possibly low in aluminum. This is significant because high phosphorus levels at low pH levels causes the phosphorus to react with the aluminum, making the aluminum phosphate unavailable to the plant. While a soil test will provide the level of phosphorus, there is usually an extra fee for an aluminum test; however, it’s needed if there are plans to have blue flowers in the future. A soil test should be taken each year if a consistent color is desired. There is no absolute recommendation for an amount of sulfur or lime to change soil pH without a valid soil test for the garden site. Websites and publications that give a detailed recipe are not accurate for specific soil situations. 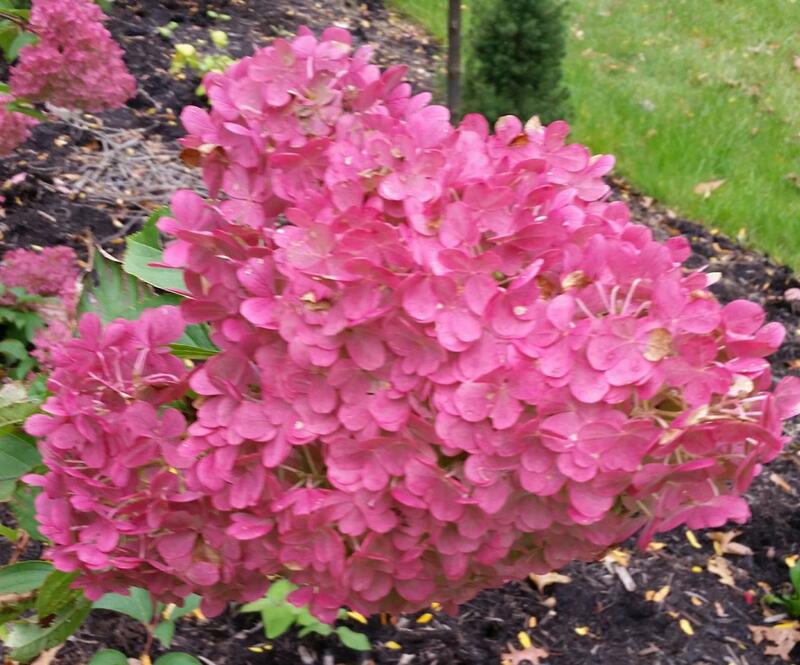 Recommendations based on a soil test are the only way to be sure the desired color can be achieved for these hydrangeas. 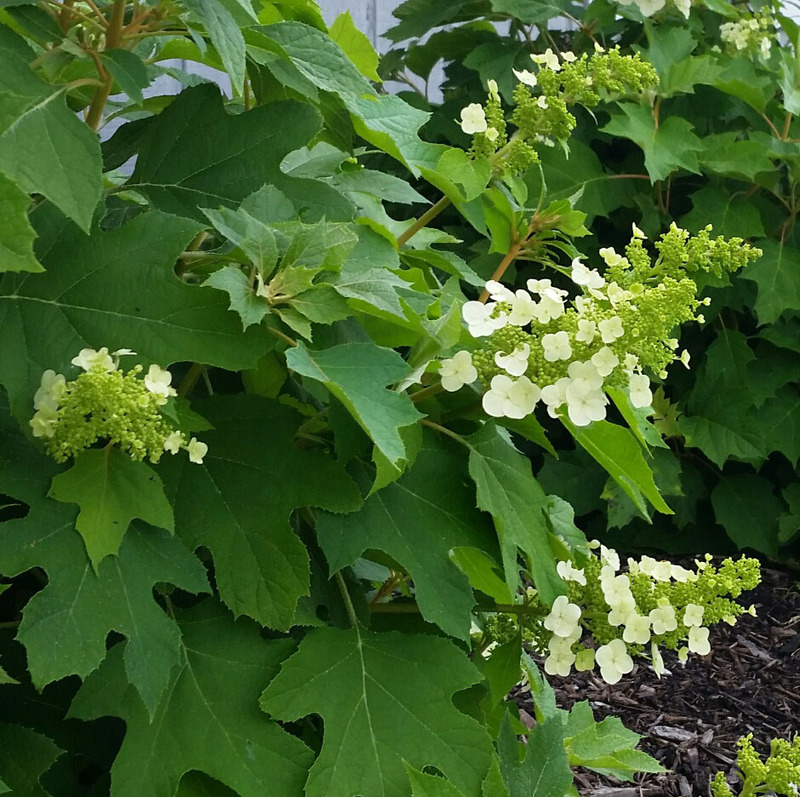 Like the oakleaf hydrangeas, this species can be propagated by layering. Hydrangea anomala looks like a plant from a different family altogether, but is a member of the hydrangea family. The lacecap flowers become numerous once this plant is established. Flowers on this plant can be white to cream as well as pink on spp glabra, ‘Crug Coral’. This climbing vine attaches to structures with rootlike holdfasts, but eventually forms a shrublike configuration (Dirr, 2004). 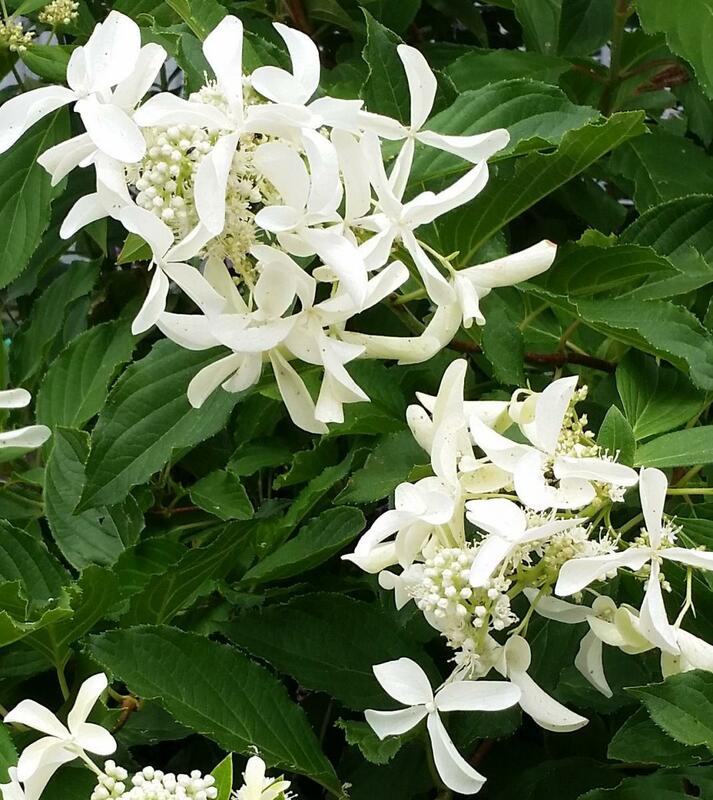 This versatility allows the plant to be grown as a shrub or trained to a trellis. The vines are very woody, with big, heavy branches requiring strong support. The leaves are glossy green in most cases, oval shaped, about 1 inch across, and pointed at the tip with fine serrated edges. The plant grows slowly for the first three years, and once established, grows rapidly. It blooms on old wood and is susceptible to desiccating winds in early spring if grown in the open. Growing this vine in a protected area, away from wind exposure will provide the highest amount of blooms and foliage. Usually, this is the north side of the home or structure. ‘Firefly’ is a variegated cultivar with dark green leaf centers and cream yellow to chartreuse green edges and features peeling, cinnamon-colored bark on older stems. Close up of one bloom of H. anomala petiolaris. 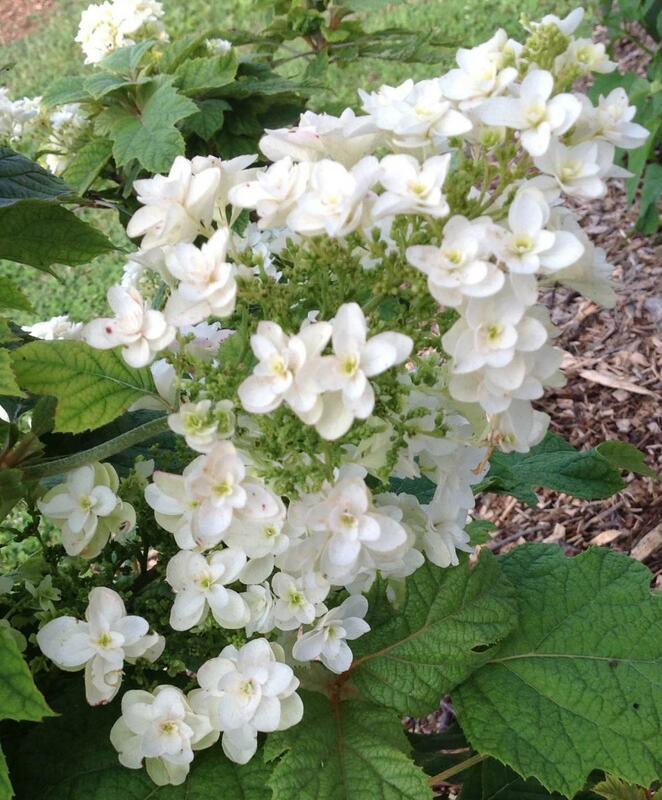 Hydrangea paniculata has been commonly called “Grandma’s PG” hydrangea. New cultivars of this species are continually released. The flower heads are primarily pyramidal in shape. Flower heads range from the full, packed flower heads of ‘Limelight’, to a combination of infertile and fertile flowers on ‘Tardiva’, to flowers that appear to not open such as ‘Little Lamb’. Flower color on this species include white, cream, lime green, pink, and even some with tinges of red. There are both tall and short versions; for example, ‘Limelight’ can be more than 8 feet tall or larger in the right location with a loam soil. Pruning these large, established plants to 24 inches after each season will result in a flush of growth the next spring with flower heads exceeding 12 inches in diameter. If a shorter height is desired, ‘Bobo’ will stay below 4 feet and provides a plethora of blooms. Compact cultivars are available that stay at 2 to 4 feet tall, reducing the need for pruning. 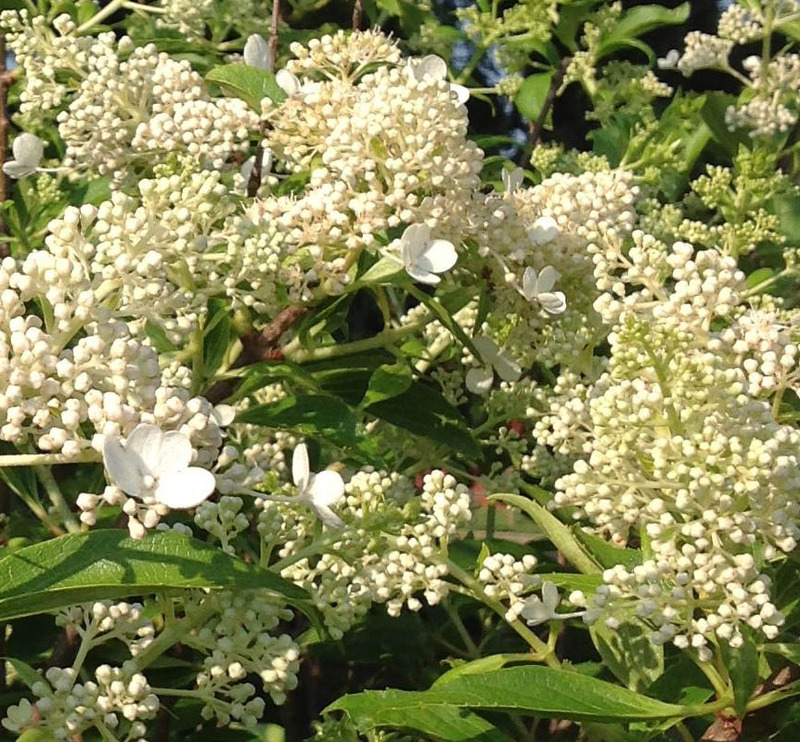 Panicle hydrangeas are the only species available in tree form as the larger cultivars can be trained to one stem to appear tree-like. While many hydrangeas leave interesting flower heads late into the fall and through the early winter, some paniculata cultivars will not lose their flower heads. Hydrangea paniculata ‘Limelight’ holds onto flower heads well into spring as new growth emerges. These can be unsightly in the garden but can be removed with pruning anytime after flowers fade. Cultivars such as ‘Great Star’ and ‘Vanilla Strawberry’ have flower attachments that are not as strong and will break off early in the winter, leaving a cleaner look in the garden in early spring without pruning. This chart summarizes the species to aid gardeners in selecting of plants for their gardens. The notations are based on observations through several growing seasons, as well as documentation in the literature. Other cultivars not listed or discussed will grow in Ohio, there is simply not enough room or experience with other cultivars to list them properly. 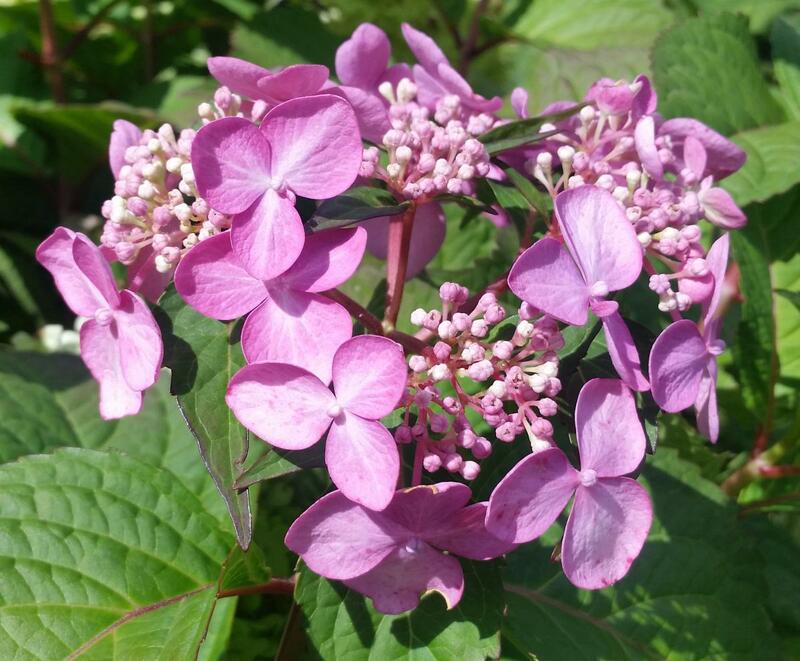 There are so many new hydrangeas on the market each year, that it is nearly impossible to list all possibilities for gardening success in Ohio. Gardeners must continue to observe new cultivars and do some basic research to make the best selection for the garden. Features Flowers mature to lime green. Cinnamon-colored bark. Excellent red fall foliage. May need to provide shelter from drying winter winds. Peeling bark. Slow to establish. New cultivars have strong stems. Fade to light green. White, ivory, green tints. Fade to pink, red, green. Blue, pink, purple. Fade to greens/blues. White, ivory. Pink tones in spp. glabra White, ivory, lime green, pink. Fade to green, some reds. Light Part sun to shade. Part sun to shade. Part to “nearly” full shade for best results. Sun to part shade. Sun to part shade. Alkaline soil = pink (6.5 or higher) Easily adaptable to all conditions. Easily adaptable to most conditions. Moisture** Moisture extends flower life Consistent moisture, but forgiving. Moisture demanding. Consider irrigation. Needs consistent moisture during early years. More forgiving as matures. Consistent moisture, but forgiving. Low moisture causes blooms to fade. Pruning Fall/spring—Cut down to 6–8". Ensures large blooms following season. Thin spring shoots for largest blooms. After flowering Shape after flowers fade. Cut dead stems back in mid-spring. Only to shape Prune to upright shrub for landscape. Cut low or thin for larger flowers. *Where trade names are used, no discrimination is intended and no endorsement by OSU Extension is implied. **All hydrangeas should be planted in well-amended, high organic matter soil with adequate drainage. ***Next year’s flowers that form on old wood are generally set in August. All photos are by Eric Barrett, Assistant Professor, Extension Educator, Agriculture and Natural Resources, Mahoning County. Dirr, Michael. 2004. Hydrangeas for American Gardens. Timber Press, Portland, OR. 236p.